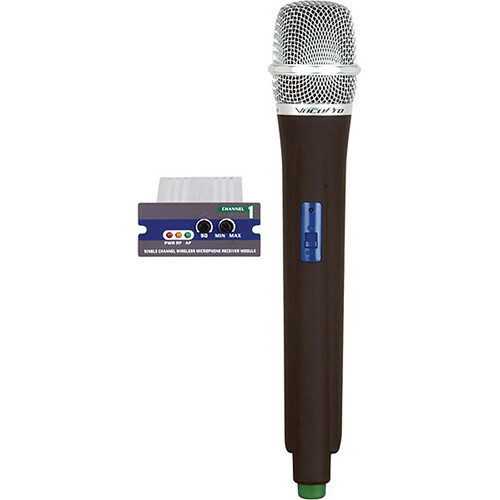 The UMH (M: 45, Yellow) from VocoPro includes a single-channel UHF receiver module and handheld microphone transmitter, which are designed for use as factory replacements for one microphone channel within the UHF-5800 and UHF-8800 microphone systems, as well as the PA-MAN PA system and PA-PRO 900 PA mixer. Receiver modules are field replaceable and easily slide out, without the need for tools, and without affecting the functionality of the other channels. The UMH module features squelch and volume rotary control knobs, which provide manual control of the microphone's signal strength and of the individual microphone channel's volume. Three LEDs indicate power, reception of RF signals, and reception of AF signals. Designed for low power consumption, the microphone operates for up to 12 hours on two 1.5 VDC AA alkaline batteries (sold separately). The UMH receiver and transmitter are tuned to Channel M: 45 and operate at the frequency of 656.825 MHz. The color assigned to the microphone and receiver serves as an indication of the specific channel and frequency used for this model.